Apply to Host a Healthy Baby Home Party! Seventh Generation Healthy Baby Home Parties are fun and informative for you and your guests, and together you will create a healthy environment for your families! And of course, the most fun of all is the opportunity to get together and talk about your kids and the things that matter to you most. The Healthy Baby Home Party kit contains educational information from non-profit partner Healthy Child Healthy World, a fun party game to help you share tips, and products and coupons from Seventh Generation, bobble, Zarbee's Naturals, Green Toys and other brands. - Accept the Healthy Baby Home Party Application offer on your Generation Good dashboard and complete the application. - Applicants will be notified by end of March if they have been selected to host a party, via an email to the email address assigned to their Generation Good member profile. - All selected applicants will then need to confirm their participation by accepting the Healthy Baby Home Party Mission in Generation Good and confirming their shipping address. - 1,900 FREE Party Kits will be distributed in this round. -Hosting spots are open to US residents only at this time. Canadian parties are planned for later in 2016! 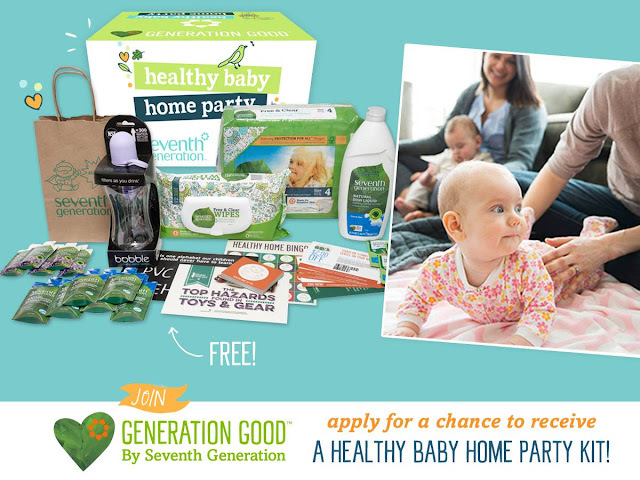 - Full terms and conditions are available within Generation Good in the "Healthy Baby Home Party Application" offer. In exchange for the post, I am entered into win a Healthy Baby Home Party as a blogger. All opinions are my own. I hosted one of these about a year ago. It was fun and they sent a lot of great samples. This is so awesome!! Im totally applying! This sounds good. May check more into it. Thank you for sharing. This sounds interesting and it might be a really great thing to do!